Abies fraseri, as described in 1817 by Frederick Traugott Pursh (1774–1820) and Jean Louis Marie Poiret (1755–1834), in Encyclopédie Méthodique. 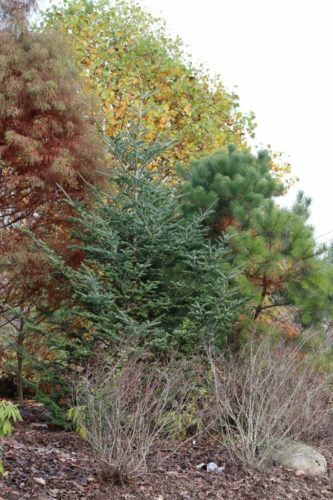 Botanique, is commonly known as Fraser's or southern balsam fir. 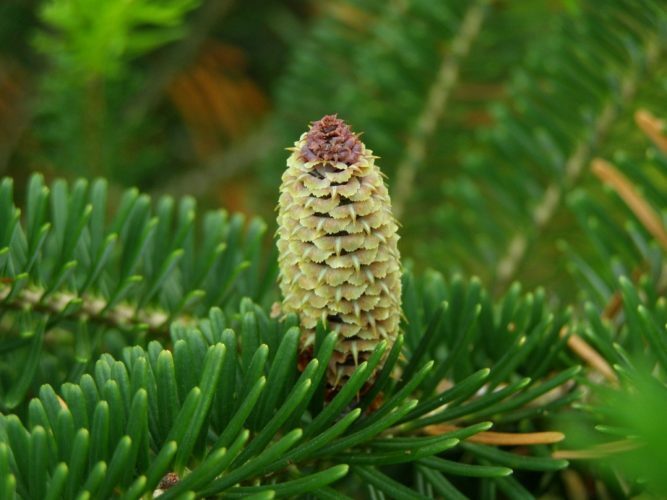 It is closely related to balsam fir (Abies balsamea), of which it has occasionally been treated as a subspecies, i.e. Abies balsamea subsp. fraseri (Pursh) (E.Murray), or a variety: Abies balsamea var. fraseri (Pursh) (Spach). The species is named in honor of Scottish botanist, John Fraser (1750–1811), who made numerous botanical collections in the region. It is sometimes misspelled as "Frazer" or "Frazier". In the past, it was also sometimes known as "she-balsam" because resin could be "milked" from its bark blisters,in contrast to the "he balsam" (red spruce) which could not be milked. 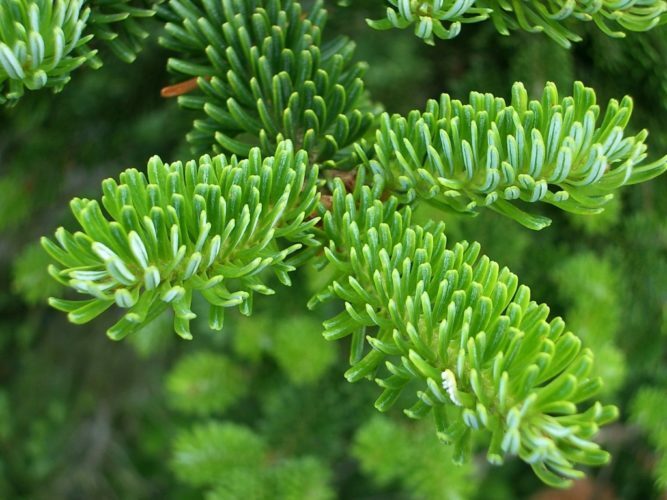 It has also occasionally been called balsam fir, inviting confusion with Abies balsamea. Ethnobotany. 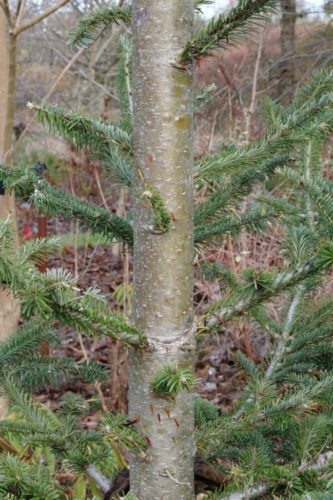 Although it is not important as a source of timber, Fraser fir is widely used as a Christmas tree. Its mild fragrance, shape, strong limbs, and ability to retain its soft needles (which do not prick easily when hanging ornaments) for a long time when cut make it one of the best trees for this purpose. Fraser fir has been used more times as the Blue Room Christmas tree (the official Christmas tree of the President of the United States' White House) than any other type of tree. It is grown in plantations in Scotland and sold by the thousands throughout the United Kingdom and Ireland. 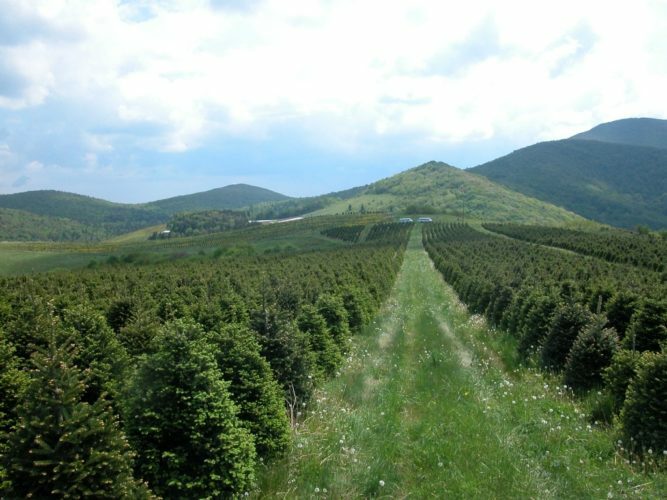 It is also cultivated from seedlings in several northern states in the USA and adjacent parts of Quebec province especially for the Christmas tree trade. Description. Fraser fir is a small evergreen coniferous species of tree that grows to mature heights of 30 to 50 feet (10 – 15 m) tall (rarely to 80 feet / 25 m); with a trunk 16 to 20 inches (40 – 50 cm) wide, measured at breast height (rarely to 30 inches / 75 cm). The crown is conical, with straight branches either horizontal or angled 40° upward from the trunk; it is dense when the tree is young, but becomes more open as it ages. The foliage is strongly turpentine-scented. Bark is thin and smooth, colored gray-brown with numerous resin blisters on young trees, becoming fissured and scaly with age. Leaves are needle-like, and spirally arranged on the twigs but twisted at the base to spread into two rows. Individual needles measure 0.4 to 0.9 inches (10 – 23 mm) long and 0.08 to 0.09 inch (2 – 2.2 mm) broad and are flat and flexible with a rounded or slightly notched tip, dark green to glaucous green above, often with a small patch of stomata near the tip, and with two silvery white stomatal bands on the underside. Seed cones are broad, erect and cylindrically shaped, measuring 1.4 to 2.8 inches (3.5 – 7 cm) long (rarely to 3.2 inches / 8 cm), and 1.0 to 1.2 inches (2.5 – 3 cm) broad (rarely as broad as 1.5 inches / 4 cm). They are dark purple in color, turning light brown when mature; with long, reflexed green, yellow or pale purple bract scales, and often resinous. The cones disintegrate when mature at four to six months old to release the winged seeds. 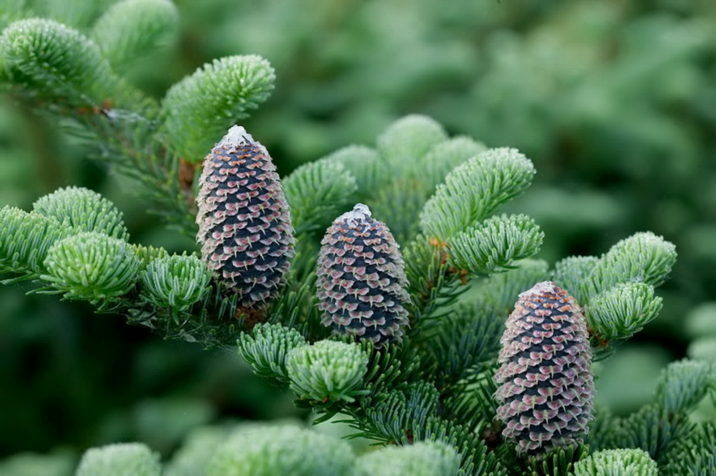 The balsam fir variety Abies balsamea var. 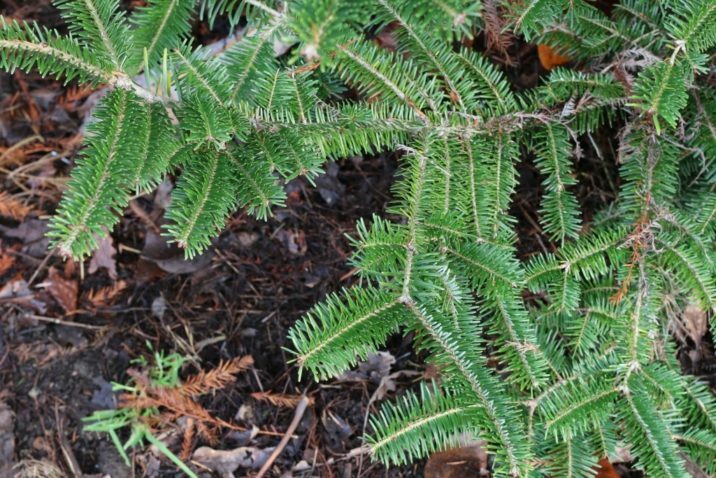 phanerolepis is regarded by some botanists as a natural hybrid between balsam fir and Fraser fir, as Abies × phanerolepis (Fernald) Liu. Distribution. This species is native to United States — southeastern Appalachian Mountains in southwestern Virginia, western North Carolina and eastern Tennessee, where it occurs at high elevations, from 3,900 feet (1,188 m) to the summit of Mount Mitchell, the highest point in the region at 6,683 feet (1,200 m up to 2,037 m). It lives in acidic, moist but well-drained sandy loam, and is usually mixed with Picea rubens (Red Spruce). Other trees it grows with include Tsuga caroliniana (Carolina Hemlock), Betula alleghaniensis (Yellow Birch), Betula papyrifera (Paper Birch), and Acer saccharum (Sugar Maple). The climate is cool and moist, with short, cool summers and cold winters with heavy snowfall. Hardy to USDA Zone 4 — cold hardiness limit between -30° and -20°F (-34.3° and -28.9°C). The species is severely damaged by a non-native insect, the Balsam woolly adelgid (Adelges piceae). 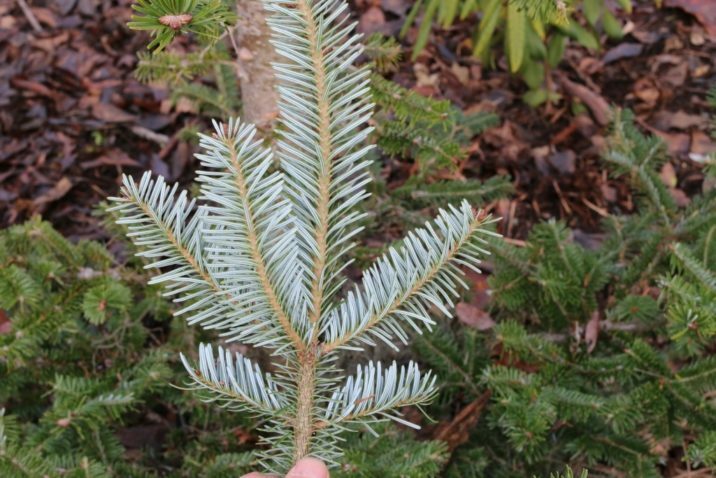 The insect's introduction and spread led to a rapid decline in Fraser fir across its range, with over 80 percent of mature trees having been killed. The rapid regeneration of seedlings with lack of canopy has led to good regrowth of healthy young trees where the mature forests once stood. However, when these young trees get old enough for the bark to develop fissures, they may be attacked and killed by the adelgid as well. 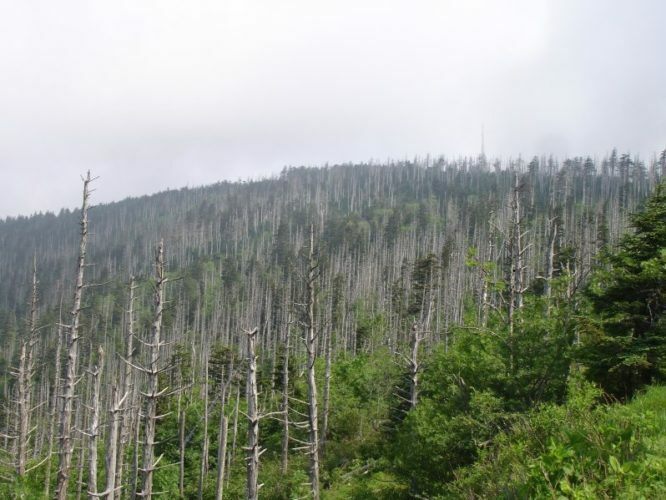 For this reason, the future of the species is still uncertain, though the Mount Rogers (Virginia) population has largely evaded adelgid mortality. The decline of the Fraser fir in the southern Appalachians has contributed to loss of moss habitat which supports the Spruce-fir moss spider. Abies fraseri — Fraser fir immature cone, upright and fragmenting. 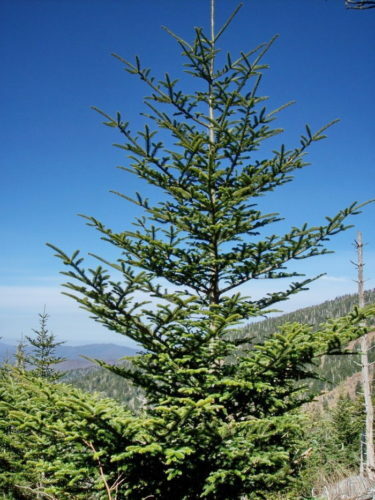 Abies fraseri — Fraser fir Christmas tree production in western North Carolina. Abies fraseri — Fraser fir killed by the Balsam woolly adelgid on Clingmans Dome, Great Smoky Mountain National Park. Abies fraseri — Fraser fir on the slopes of Clingman's Dome, Tennessee, the highest point in the Great Smoky Mountains National Park. 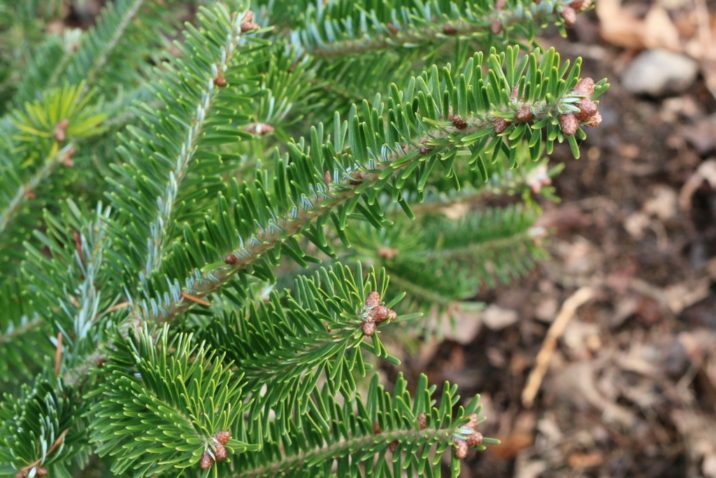 Abies fraseri — foliage detail. 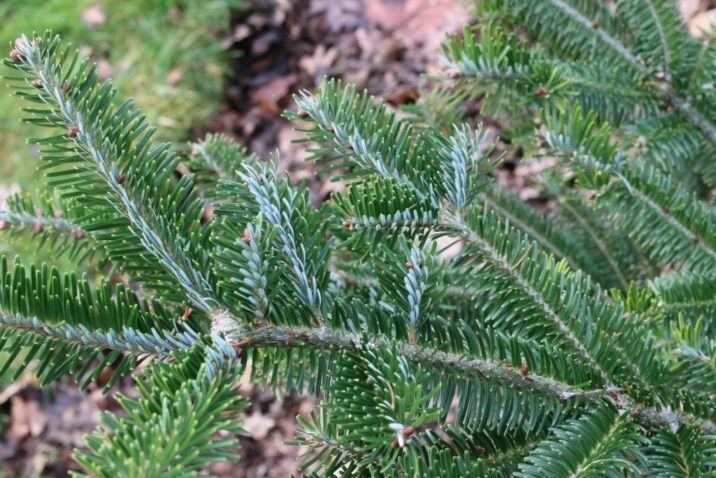 Abies fraseri — foliage detail, showing the white abaxial surfaces. 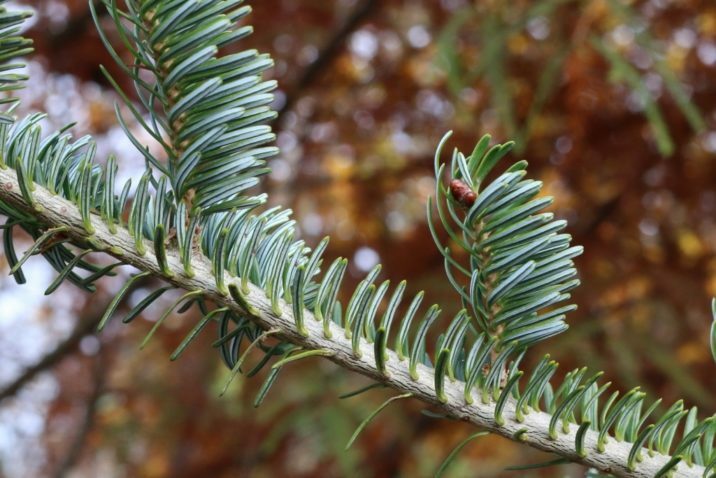 Abies fraseri — closeup of needles and needle attachments.